We advise beginners first to play a few games to familiarize with how the game works. The rules of Othello are so simple that you can learn them in one minute, although it takes maybe a lifetime to master the game. Let's overview some principles and ideas that will help you to win games. Othello is a game of skill. Luck rarely affects the outcome of a game. The player who can better apply the strategic principles of the game will consistently win against less well-informed players. 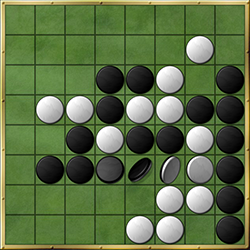 The game of Othello is divided into 3 phases. The opening is the first 20 moves, and the midgame is the next 20 moves and the endgame the last 20 moves. 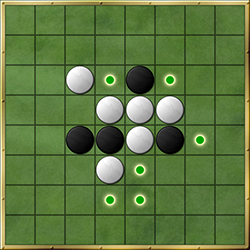 The opening phase of Othello can be described as a "battle for mobility" often referred to as mobility optimization. Each player tries at each turn to have greater mobility (more moves) than the opponent. New players to the game too often tend to try to have the most discs at each stage of the game. To do this, they play at each move the move which turns the highest number of discs possible. This is called the maximum disc strategy. But this strategy is usually not a good strategy. An Othello game is won on the end, and the discs can flip very often. The corners are special because corner discs can never be outflanked. Because of this, they can protect whole collections of discs from capture. Always avoid placing a disc next to a corner. Instead, make a plan to push your opponent to place a disc next to a corner. When you can own two adjacent corners, you will own the connecting side. When you can own three corners, you will own at least two sides. The corners and the edge squares together add up to 28 squares which means almost halved of the total of squares. If you have many good options to place a disc while your opponent has only a few poor ones, you are in control of the game. Try always to minimize your opponents move options. Less importantly, maximize your own move options. If it is possible, then force your opponent to forfeit their next turn whenever possible. Stable discs are discs that cannot be flipped for the rest of the game, no matter how the game will develop. Usually, it takes until the end game before you can gain stable discs. The easiest way to increase your relative mobility compared to that of your opponent is to have fewer pieces on the board. Your opponent knows this as well and will probably try to do the same. The discs which have empty neighboring squares form the frontier while those that do not are called interior discs. The fewer frontier discs you have, the fewer choices your opponent has. That is the key to winning the battle for mobility. If a player has only one legal move, no matter how bad it is strategically for them, he must take it. Force your opponent this way to place a disc next to a corner. In order to do this, you probably have to sacrifice some of your discs in order to gain something better. As there is an even number of squares on the board and black always plays first, this means that white always plays last. This is known as parity. Establishing parity involves leaving an even number of empty squares in each region in which the opponent can play. In other words, it's better to play in closed off regions that have an odd number of open squares and to avoid those with an even number of open squares.